Two artists. Two distinct styles. One exhibition. One usually thinks of light being that which displaces darkness. But in truth, without darkness, light would be meaningless. Dark and Light are, in fact, symbiotic. And in order to arrive at true understanding, a certain amount of deconstruction is required – the taking apart of concepts, events, stories, etc. to better understand each component, and how they interrelate to one another to form the whole. These concepts underlie the works presented in this two-man show, featuring the art of Art:tech and Skinner, two young Malaysian artists. Art:tech,Â best known for his digital illustration art, presents to us a collection of hand-drawn iconography that have gone on to become the recognizable mystical characters we see in his digital works. Combining these archetypes and placing them in a dreamlike setting, his uniquely styled illustrations have earned him recognition, including being named as one of the Top 30 young Malaysian digital illustrators by Digital Malaya Project, and in addition, being featured in a few Spanish art and design blogs, such as Oldskull.net and Area Visual. For a number of his hand-drawn art, this exhibition marks the first time they have been publicly exhibited.Â The collection of works exhibited by Art:tech, collectively called â€˜Dark Lightâ€™, is representative of his artwork style as a whole. Itâ€™s a study of contrasts, of black and white, dark and light.Â They comprise primarily of works done in pen and pencil on paper, coupled with a few of his digital art works. His art is spontaneous, representing the things he sees, feels, and learns as he goes through life. Some of it, the artist himself admits, doesnâ€™t make sense even to him. Those who have been following Artemis Art may be familiar with Skinner, an artist whom we have been featuring at the gallery for the last two years. He is perhaps best known for his intricate roots-based motif series, Dark Forest, and also the slightly less intricate (but still very detailed) Smoke series. Both series are primarily ink on paper, a medium that Skinner has chosen to stick to for his new conceptual thrust. Deconstruct is the artist’s new series of works that focus on skull portraits, some of whose subjects have been taken from very recognizable classical art works. For this series, Skinner has taken the concept of deconstruction literally, peeling away the epidermis to reveal the structure that lies beneath. In other words, reality is deconstructed from a literal, anatomical sense. Skinner is of the opinion that skulls and skeletons shouldn’t be stereotyped as ‘scary’. They do, after all, form a very important part of human anatomy, providing the core structure around which the rest of our anatomy is built around. His somewhat playful ‘deconstructions’, some of which focus on very iconic and very recognizable classical artworks, is testament to this notion. On the surface, Dark Light and Deconstruct may appear as two distinct exhibitions. But common threads run through the bodies of work presented by both artists. Art:tech and Skinner both utilize juxtapositions of dark and light in their works, albeit in slightly different ways. Similarly, both artists deconstruct their own realities and ideas. While one does it in a literal anatomical sense, the other is more metaphysical in his approach. 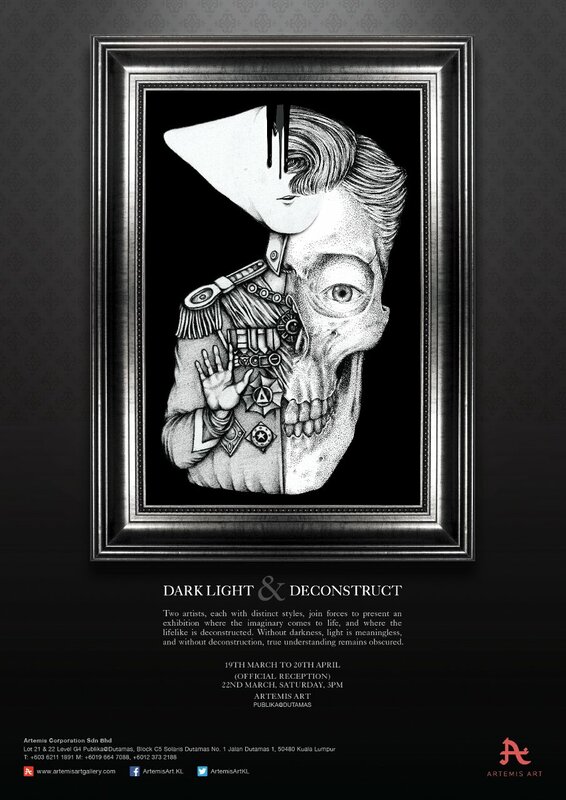 Dark Light & Deconstruct begins its run at Artemis Art on Wednesday, March 19, and continues until Sunday, April 20, 2014. We will have a small opening reception for the exhibition at 3pm on Saturday, March 22, 2014, during which time both artists will be present. The opening reception will be a good opportunity for you to delve deeper into the minds of these two artists. For the first time, Artemis Art will be offering for sale limited edition signed prints of selected artworks on display from both artists. We are quite certain that this will be an exhibition unlike any other we’ve done at Artemis Art thus far.